Pulse egg yolks, both flours, baking powder, salt, and granulated sugar in a food processor to combine. Add butter and pulse until only pea-size pieces remain. Drizzle in 2/3 cup cream, then pulse 2-3 times to barely incorporate. Transfer dough to a work surface and gently fold on top of itself several times just to bring it together and work in any dry spots. Using a 2-oz ice cream scoop, make 6 balls and place on parchment-lined baking sheet. Do not flatten. 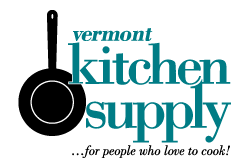 (Or measure out mounded scoops with a 1/4-cup measuring cup.) Cover and chill until cold, 20-25 minutes. Preheat oven to 350°. Brush tops of shortcakes with remaining 2 Tbsp cream and sprinkle with sanding sugar. Bake until golden and sides are firm to the touch, 28-32 minutes. Let cool. Toss strawberries, granulated sugar, lemon zest, and a pinch of salt in a medium bowl to combine. Transfer half of strawberries to large saucepan and add 1 Tbsp water; let remaining strawberries macerate while you bring strawberries in saucepan to a gentle simmer over medium-low. Cook, stirring occasionally and reducing heat if needed to keep at a low simmer, until strawberries are starting to break down and become jammy and liquid is syrupy, 12-18 minutes. Let cool, then stir in 1 tsp lemon juice. Stir in remaining 1 tsp lemon juice to macerated strawberries. Split shortcakes and divide strawberry compote, macerated strawberries and whipped cream among bottoms. Close with shortcake tops. 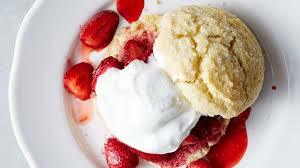 Tip:Shortcakes can be baked 1 day ahead. Store airtight at room temperature. Reheat before serving.